MOSCOW (APP): Russia said Thursday it had bombed extremists groups in Syria using cruise missiles launched by strategic bombers deployed from Russian territory. The defence ministry said its bombers on Thursday "launched cruise missiles against targets of the Islamic State terrorist group and Jabhat al-Nusra", referring to Al-Qaeda's former Syrian affiliate, now known as Fateh al-Sham Front. 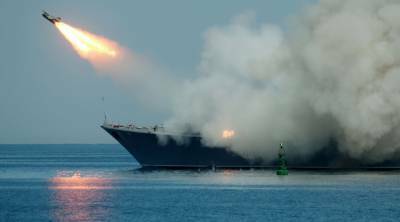 The cruise missiles were launched from above the Mediterranean Sea, the statement said. The planes left Russia and covered 11,000 kilometres (6,800 miles), travelling "over the waters of the northern seas and the eastern Atlantic," the ministry said, without explaining why the planes had taken this flight path. The ministry added that Sukhoi Su-33 fighter jets -- which took off from Russia 's Admiral Kuznetsov aircraft carrier deployed in the eastern Mediterranean -- had supported the strikes. The strikes targeted "terrorist command centres, warehouses with ammunition and weapons", as well as a weapon-making workshop, the ministry said. The statement did specify where the strikes had been carried out. Earlier Thursday, the defence ministry said that at least 30 extremists in rebel-held Idlib province had been killed in strikes that began Tuesday from planes dispatched from the Admiral Kuznetsov. Tuesday's strikes marked the first time the Admiral Kuznetsov -- Russia 's sole aircraft carrier -- had taken in part in combat. The Admiral Kuznetsov arrived in the eastern Mediterranean off the Syrian coast as part of a flotilla of ships sent to reinforce Russia 's military in the area. The biggest naval deployment of recent years saw the flotilla sail from Russia 's Arctic waters down through the North Sea and along the Channel. Russia has been flying a bombing campaign in Syria for the past year in support of its ally President Bashar al-Assad . Russia says it has halted air strikes on rebel-held eastern Aleppo since October 18 following international condemnation over its ferocious bombardment of the city.